This November, BEAR ALBANY turns 13! Call it a birthday, call it an anniversary – we’re calling it an all-out party where size matters! We’ve added more events to Sunday Fun-Day so be sure to book an extra night at the host hotel using the BEAR ALBANY discount. Don’t forget it is a holiday weekend so join us for an extended Annibirthaversary blast! Meet and mingle with friends old & new. ROCKS Models in the Pub, Bearaoke in the Club. If socializing is your thing, then the pub is for you, otherwise show us your vocal talents in the club at Bearaoke. Daytime happy hour extended to 10pm so get your butts out early. Keep an eye out for some other fun activities throughout the night. Lots to do in and around the city. Enjoy lunch at one of the local breweries or restaurants, walk the downtown and Empire State Plaza or make your own fun. Today is the Albany Veteran’s Day parade so come out and show your support for our active duty military and veterans. Parade starts at 11am at Central and Quail and goes east on Central towards downtown. 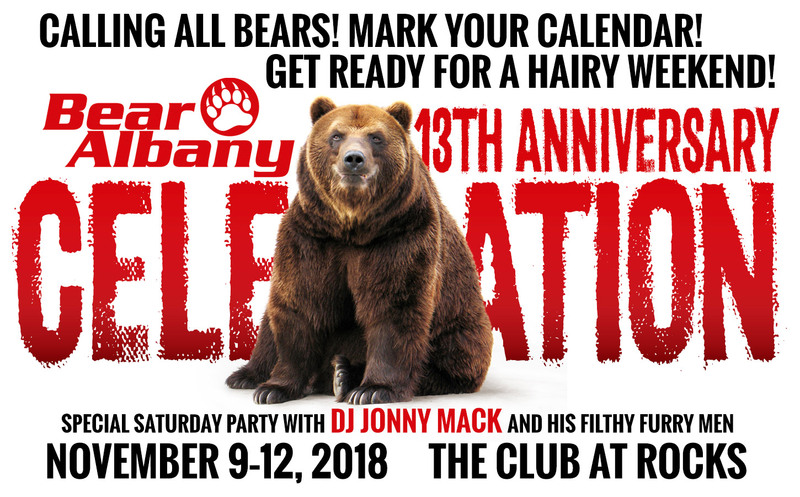 At the dance party, the hot and handsome DJ Jonny Mack is our guest DJ for the night who’s bringing along his filthy furry men from NYC to keep you entertained. Don’t miss these hot furry men! Sleep late, dust off the cob webs and grab some brunch then get back to ROCKS for Sunday T. Doors open at 2 with $4 HUGE Ice Teas, $10 Buckets of Bud & Bud Light. ROCKS famous Chili Cook-Off Contest is today! Sample savory chili recipes from local participants and have the chance to be a judge! Chili sampling and contest at 5p, followed by a FREE buffet.... then its 2 Bears & a Mic Karaoke at 7p to finish out the night. Don’t miss this fun, action packed Annibirthaversary weekend! Love your facebook page. You guys rock. Your event is during my birthday weekend. GRRRRRRRRRRL! !